To the late Paul G. Allen, the University of Washington felt like home. He and his younger sister, Jody, grew up in the Wedgwood neighborhood not far from campus and happily spent many hours of their young lives at the UW. Sometimes, they and their mom would sit in the family car reading while waiting for their dad to finish his day’s work as associate director of UW Libraries. Allen also loved to frequent the campus’ libraries to read books about space and science, and he eagerly and often attended Husky football games with his father. His exploits as a teenager are perhaps best known, when he and fellow Lakeside School classmate Bill Gates came regularly to the UW campus to use computers. That special bond Allen had with the UW would last the rest of his life, and his impact will be felt on campus­—as well as on society—forever. Allen, who died Oct. 15 at the age of 65, lived a life that embodied the spirit of the UW through his relentless quest for learning and drive to innovate. He saw possibility everywhere, which is why he and the UW were so intertwined and why he became one of the University’s most ardent supporters with generous gifts and big ideas that have touched the lives of just about all of us. And why he transformed the world in so many ways. His legacy started innocently enough, when Allen and Gates were high school students who came to campus to use the UW computer lab. They spent so much time in the computer lab that in 1971, Allen received a letter from Hellmut Golde, then-director of the computer science laboratory, telling him, “In view of … a number of complaints from the regular users of the Laboratory, I must ask you to turn in your keys and terminate your activities in the laboratory immediately.” He and Gates had overstayed their welcome. But being asked to leave the computer lab did nothing to tamp down their innovative spirit. 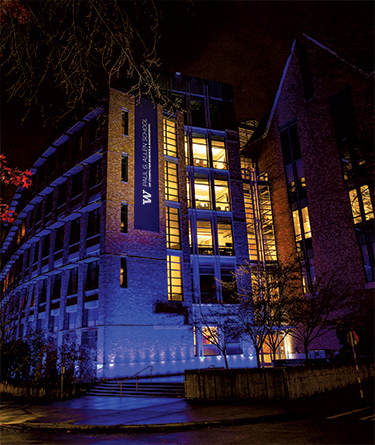 The UW joined the city of Seattle in paying tribute to the late Paul Allen Nov. 3-4 by illuminating buildings with blue lights as “beacons of remembrance.” Photo by Dennis Wise. Allen’s foresight and generosity went a long way to make the UW a pathway for incredible impact in a variety of fields. Allen was interested in nearly everything—computer technology, biology, brain science, space, rockets, endangered elephants, orcas, and other species, movies and sports; don’t forget that it was he who saved the Seahawks from moving to California in the 1990s by buying the team and getting a new stadium built in Seattle. Allen also was renowned for his love of music. Gilbert, ’73, said that when he would go to Allen’s home to work on the Traf-o-Data computer in the early ’70s, Paul would play the guitar all the time. “He never wanted to concentrate on one thing,” Gilbert says. Befitting his interest in culture, Allen opened a number of museums, including the MoPOP (formerly the Experience Music Project) at Seattle Center, as well as the Living Computer Museum in SoDo, which features computers from various decades. “To be able to bring our students down to the Living Computer Museum and show them where all the stuff they use today came from is just mind-boggling for them,” Lazowska says. Cancer made its appearance in 1982, when Allen was first diagnosed with Hodgkin’s lymphoma. He survived that but later developed non-Hodgkin’s lymphoma in 2009. He survived that, too, but the cancer returned this past fall and proved to be too much. Jim Caple is a frequent contributor to Columns. He used to write for the Seattle Post-Intelligencer, St. Paul Pioneer-Press and ESPN.